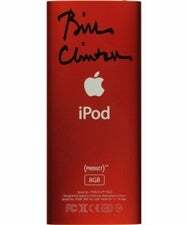 In addition to his John Hancock on the back, the iPod includes 10 of Slick Willie's favorite tunes, such as Van Morrison's classic "Brown Eyed Girl," and some more surprising choices like Ralph Vaughan Williams's "English Folk Song Suite," and Elton John's "Philadelphia Freedom." Plus, if you win—bidding is currently $751—you also get a $25 gift certificate to iTunes. No word on how much more you'd have to pay to get a personalized recording of Clinton rockin' out on his sax.